Child Care Need Assessment | Propel L.A. Working families of all income levels often rely on independent child care when parents or legal guardians are away. 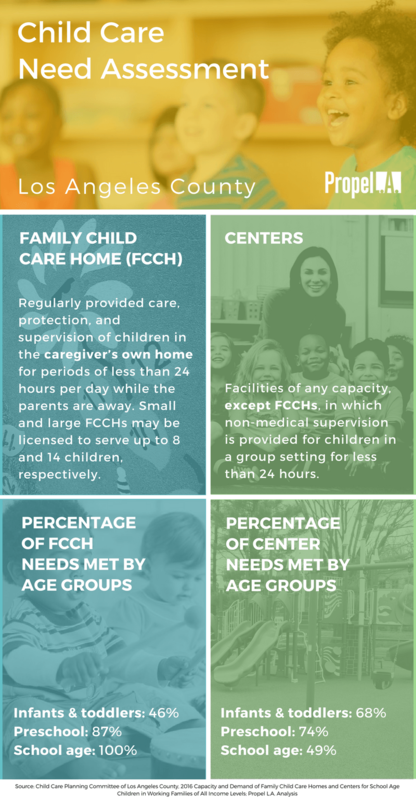 According to the 2016 data from the Child Care Planning Committee of Los Angeles County, the County is facing a shortage in licensed child care capacity. This means the number of children who are likely to use licensed care exceed the number of spaces available. For example, the Child Care Planning Committee assessed that there were 47,883 spaces in licensed center capacity for infants and toddlers (ages 0-5) and 70,806 children in the respective age group. The ratio of 47,883 to 70,806 reveals that only 68% of child care center needs are met. Family Child Care Homes are defined by the California Health and Safety Code as regularly provided care, protection, and supervision of children in the caregiver’s own home for periods of less than 24 hours per day while the parents or authorized representatives are away. Small family child care homes may be licensed to serve up to eight children, while large family child care homes may be licensed to serve up to 14 children. Centers are defined as facilities of any capacity, except small.0+6400 and large family child care homes, in which non-medical supervision is provided for children in a group setting for less than 24 hours.